The Douk-Douk pocket knife is a minimalist folder design that's been in use for over 70 years and famous in the former French colonies. The folded steel handle has a slip-joint mechanism and bail loop for lanyard. 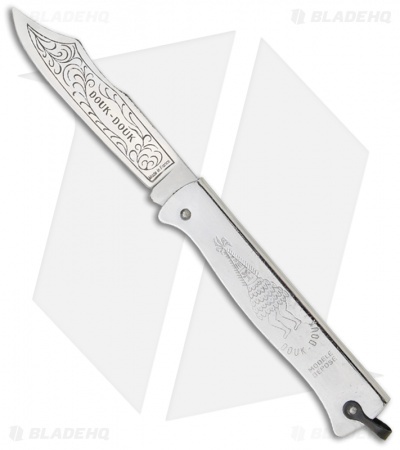 Carbon steel blade with scroll etching and handle features Douk-Douk artwork. 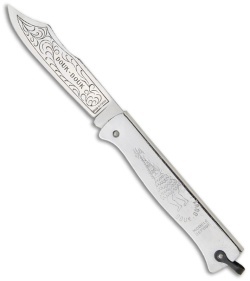 I bought this knife for the history behind it. Brought into production around 100 years ago, it's still the same classic design. You also get a lot of knife for the price too. It's not the most comfortable handle, but is ultra simple and not much to go wrong with this slip joint. The spring is extremely strong though. It is not the smoothest opening, but you should have little to no fear of it closing unintentionally.